Interested in learning to play one of the world’s most beautiful instruments, the violin? Consider enrolling with Knauer Music School. The premier Los Angeles-area violin lessons School helps Agoura Hills residents ages 3 and up perfect their craft on high-quality acoustic violin. Teachers are warm, patient experts dedicated to helping students learn more about this amazing violin, and provide lessons surrounding Jazz, Pop, Classical, Cultural, R&B, and other areas of focus. Agoura Hills is one of the main cities within Los Angeles County. Its nearby downtown Los Angeles and features numerous natural areas laden with stunning native plants. In addition to its natural beauty, Agoura Hills is celebrated for its vibrant music scene, and is considered the birthplace of nu metal. Such bands making up the nu metal genre include Linkin Park, Incubus, Hoobastank, and Dub Thompson. The Agoura Hills also plays home to the famous Canyon Club venue, which has hosted the likes of Cyndi Lauper, Foreigner, Pat Benatar, Peter Frampton, and REO Speedwagon among others. Residents of Agoura Hills have wonderful things to say about the husband-and-wife team that founded Knauer Music School, as well as the many talented teachers that make the violin lessons school such a beloved part of the community. 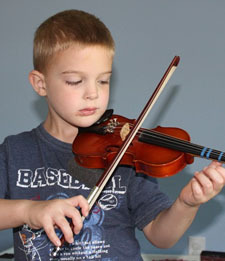 Call (818) 343-7744 for more information more information about violin lessons in Agoura Hills, CA.